well, i successfully made candy for the first time, + surprisingly, it wasn’t nearly as difficult as i anticipated. in fact, it was easy. who knew? i know that august isn’t exactly caramel season, but over the weekend, i made some delicious salted caramel buttercream for the Let’s Bring On Fall party (full recipe coming soon! ), which made me wonder, how hard would it be to make actual salted caramels? apologies that the picture isn’t wonderful, but taking photos of caramels outside on a hot, sunny day meant that i had to act quickly (before they melted) + this was the first picture i took! line bottom + sides of an 8” square baking pan with parchment paper, then lightly oil parchment. bring cream, butter, + fleur de sel to a boil in a small saucepan, then remove from heat + set aside. boil sugar, corn syrup, + water in a 3-4-quart heavy saucepan, stirring until sugar is dissolved. boil, without stirring but gently swirling pan, until mixture is a light golden caramel. carefully stir in cream mixture (mixture will bubble up) + simmer, stirring frequently, until caramel registers 248°F on thermometer, 10 – 15 minutes. pour into baking pan + cool 2 hours. cut into 1-inch pieces, then wrap each piece in a 4” square of wax paper, twisting 2 ends to close. I’ve been waiting for this recipe, and it did not disappoint–I love how easy it looks. Meaning a non-candy maker like me might even be able to give it a whirl! 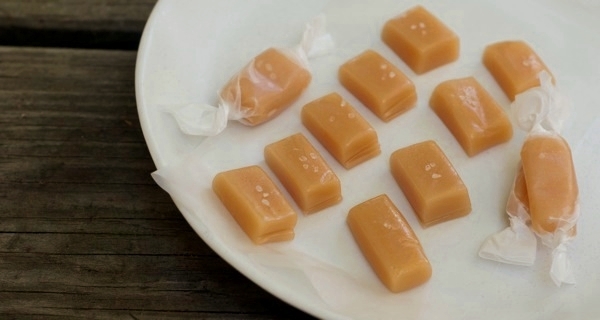 I love caramels, so I’ll definitely try my hand at these. Thanks! yay! if i successfully made these, anyone can – it’s really simple! we got a candy thermometer as a wedding gift so it was pretty much just a matter of watching ’til it hit the right temperature, pouring it, letting it set, + cutting it. voila! I have to admit, I’ve never been brave enough to try making candy. You sure do make it sound easy! They look delicious too. And tell me about it…I am sooo over this heat. Bring on Fall! i’ve seen some of the amazing things you make – if i can make these, you can probably make ’em blindfolded! i’ve got good news for you – the 10 day forecast shows quickly dropping temps, so our beloved fall might just be here soon. i guess the Bring On Fall party must’ve worked?! Oh those looks so pretty, like straight out of a Williams Sonoma catalog! Candy intimidates the crud out of me. My Mom’s an expert, so i just let her supply us with homemade candy around the holidays. But these look super easy. And salted caramel butercream? Can. Not. Wait. for that recipe. Hope y’all had fun at the party! they look so good! I’ll take a package…just ship some right now. Recipe will be bookmarked and/or printed. I’ll need it when I get into candy making mode during the holidays. aww, thank you so much Rachel! 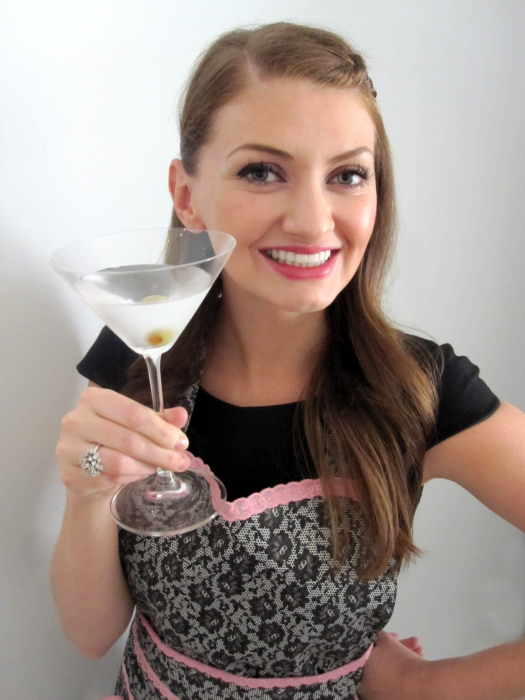 i’m glad you found your way to my blog – off to check yours out now! Yum! I made salted caramels for the first (only) time last Christmas. I agree it is simple, but I think it is TERRIFYING! Boiling sugar and adding cream so that it bubbles up like crazy – seems like I narrowly escaped with my life. I’m kinda klutzy, so I was shocked that I didnt burn myself while doing it. Lovely! But I refuse to buy a candy thermometer. I will just hope that Trader Joe’s sells their version again this holiday season. Or that I get some at a potluck (hint hint). i had refused to buy a candy thermometer, too, but then one of my lovely friends gave us one as a wedding gift. whoop! i will absolutely make these for you for our holiday potluck. promise! I LOVE Caramels, and nothing beats homemade! These look perfect! Never have tried a salty version of them though! you’ll definitely have to give the salted version a try if you’re someone who likes sweet/salty flavor combinations. for me, they are just perfection! Yummmy!! I love caramel. But like you, I’m always afraid that it will be too difficult to make! i know – i couldn’t even believe how easy it was to make. you’ll have to try it now! Took me like 2.5 seconds flat to get here once I saw the blog posted on FB. Hell to the Yes! I’m totally making these. I love your photo, they look so chewy and gooey! ha! you’re the fastest mouse clicker on this side of the mississippi. the texture turned out perfectly – i was worried i might overcook them (+ have them turn out like hard candies) but the texture is just like you said – chewy + gooey! Can I eat the whole pan and not be looked upon badly? Do you have to use the special brand sea salt? Fun fall teacher treat, I always make chocolate chip pumpkin bread. These look delicious! Might have to dip a few in Chocolate, too! i didn’t even think about dipping them in chocolate – what an awesome idea! they’d look (+ taste) fabulous half-dipped in dark chocolate. might have to try that soon! I am so a caramel girl! These look so creamy and beautiful, thanks for the recipe! caramels were one of the candies we ate growing up (our grandmas always had them on hand), so i’m such a caramel girl, too – they’re comfort food to me! I am SOOO saving this recipe! I think I may be doing salted caramels for Christmas this year…so I’m glad I found this! I shared a link to these on my blog after making them and LOVING them! Thanks for a great recipe! i am so happy to hear that, tasha! i love it when recipes turn out just as great for other people as they did for me. =) off to check out your post! Previous post: help with menu ideas? Let’s Bring on Fall party!